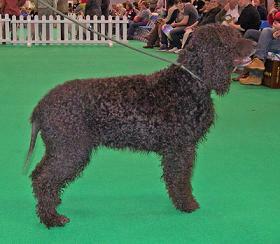 A true success story: using a Barbet to cross into the Irish Water Spaniel as you can see a descendant. This one was shown at Crufts this year and is well known for having a Barbet-type coat (silky shiny and oily ) and the Barbet's excellent character. The IWS/BARBET cross interested me. As we had one here in the UK, I searched for the author of several articles pertaining to this litter . After finally tracking him down, I managed to speak with him by pure coincidence on the day that the breeders from Holland were arriving at his home for a weekend of shooting. John was the most charming gentleman you could wish to meet. One of the differences of Summer Jazz from an IWS was that it was not aloof, and that it was a 'kind' dog, the temperament is certainly different. The coat too was different, though to the untrained eye it would not be noticable, both he and the breeder called it the Barbet coat (the breeder has met many Barbet in her native Holland). I have never been too fond of the IWS, but this one was so friendly, that it had me sitting on the floor allowing my face to be licked. Now, the reason for the outcross....... IWS have not had a very good record for reaching an old age, longevity was one of the reasons given. Cancer and epilepsy in the IWS were the other two reasons. The first outcross was Barbet/IWS Hercule x Posidonia Donais Then it became confusing as pedigree databases stated 2 differing versions. However, the next stage was to mate one of the offspring of that mating Verveine back to an IWS Donais Profusion giving three pups. The Poppenspalers B litter has been very confusing. John was told at first that there were only 2 IWS pups, later he was informed that the breeder had actually kept a third one (with a bad temperament). He is delighted with Jazz, as the breeder still is with R'Bloody Mary, and as they chose well by using Jiggs, hopefully longevity will be the result of these outcrosses. He also had no problem registering Jazz here with The Kennel Club. The entire litter across Europe have made fantastic achievements in the working field. Article written by Yvonne Thomas in the UK.Thank you Yvonne!